It’s been just over a decade since GMC rolled out the Acadia and it still tends to fall widely under one-of-two demographic umbrellas: that of loyal enthusiasts, or those likely to casually overlook it amidst of the sea of more uninspired SUV offerings. But if the segment as a whole can prove to be somewhat formulaic, the 2019 GMC Acadia might just be the sleeper-hit of the segment, thanks to its standout design, confident performance, and genuinely evocative sense of luxury. But the Acadia also offers an intimate and personalized experience for driver and passengers alike. Thanks to Active Noise Cancellation, the upscale cabin design is even more relaxing and comfortable than one might expect. And the availability of 4G LTE WiFi ensures that the Acadia performs seamlessly with the evolving expectations of those who find themselves seated (so comfortably) inside of it. Depending on your needs, there are a number of configurations that you can choose from in the hopes of finding the Acadia which best fits the unique demands of your lifestyle and budget. Available in both Front and All-Wheel Drive options, it simply comes down to determining what you want and need. Kicking things off are the (base) SL, which is priced to start around $30,195 MSRP. It offers seating for up to seven passengers, comfortably, thanks to second and third-row split-bench fold-flat seats. For the most part, this is the framework for all Acadia regardless of trim level selected. However, the wide-array of comfort and tech amenities found in almost any GM is worth noting, and the Acadia is no exception (especially as you jump trims). The SLE-(1,2) range from $33,595 to $36,195 MSRP while the SLT-(1,2) range from $39,495 to $42,895 MSRP. We’ll get to the features and power ratings that separate each offering from one another, but not before we introduce the line-topic Denali trim which is priced to start around $46,095 MSRP. That said, let’s take a closer look at the options available and the countless attributes that make the Acadia such a compelling offering. Beginning with the (base) SL trim, the Acadia is powered by a 2.5-liter 4-cylinder engine paired to a 6-speed automatic transmission. Channeling 193 hp and 1855 lb-ft of torque, the SIDI engine is equipped with variable valve timing and start-stop technology that aids in terms of fuel economy. This same configuration is utilized in the SLE-(1,2) and SLE (1) trims. Stepping up to the SLT-2, we gain the upgraded power of a 3.6-liter V6 with Direct Injection and VVT, which churns out 310 hp and 271 lb-ft of torque. The same engine spec is used on the Denali trim, as well. Even among some of the inherent redundancies of SUV design philosophy, the GMC Acadia presents a distinctive profile easily discernible from that of its competitors. Walking around its contoured and aerodynamic body provides a sense of scale, conveying the confidence of its wide-stance while making the smart choices lend it a more tailored look. In terms of front fascia, GMC continues to favor a modest on-brand approach, and the gamble pays off. 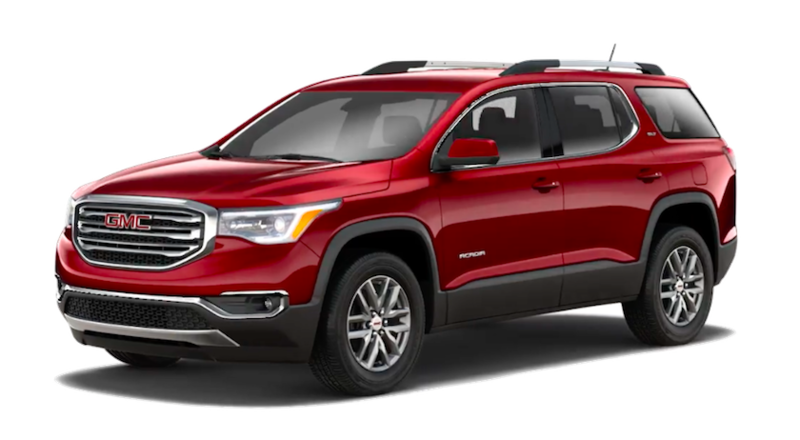 Simple and refined, there is no mistaking the 2019 GMC Acadia for any other SUV. And with a wide array of OEM accessories to choose from, there are countless ways to personalize your Acadia and make it your own. From three standard choices of wheels (painted aluminum, machined faced and Sterling silver painted) to power sunroof, GMC’s adherence to a “less is more” mindset provides the buyer with some blank canvas upon which to personalize their Acadia experience. And in terms of colors, the Acadia appears enticing in Crimson Red, while cool and aloof in White Frost, Quicksilver or Iridium Metallic. The added inclusion of Blue Steel Metallic and Ebony Twilight Metallic, reinforce traditional aesthetic. As with nearly all of their offerings in the truck and SUV segments, GMC’s design of the Acadia emulates the spaciousness and affluence of a higher-priced offering. They excel in the creation of a spacious and comfortable passenger experience, albeit within a cabin designed intuitively around the driver. The cockpit includes seating which has been empowered with great driving position, and the ease of control through intelligent placement shows a clear sense of balance between the modern appeal of touchscreen interfaces and the reality of real-time operation. In terms of driver visibility, the Acadia is extremely successful at minimizing obstructions. Offering almost panoramic visibility, the care and effort put into the Acadia’s functional design are both clear and evident. Minimizing both air and road noise, the Acadia creates a smooth and comfortable driving experience. Its well-contoured seating holds comfort, even over longer drives, and performs consistently across all three rows. And with an array of intelligent and tasteful material choices made across all trim levels, GMC has created a spacious and well-designed cabin experience to be enjoyed by both passengers and driver alike. One area where the Acadia excels is in terms of its on-road drivability, ticking nearly every box we could think of. With confident performance specs, there’s no risk of the Acadia being at a loss for power, and its acceleration has proven capable of surprising more than one or two industry reviewers. Excelling at the management of its own weight, the Acadia also receives high marks for its lightly-weighted steering and the superior maneuverability that it offers. Factor in a capable braking system and it goes without saying that the Acadia loses none of its appeal when in motion. Offering 21 mpg city / 26 mpg highway, the Acadia performs competitively with its in-class competitors while out-classing many of them based on consistency alone. If you’ve never given any thought to the GMC Acadia, isn’t it about time that you do? Otherwise, you might never find out what you’ve been missing out on. Is the GMC Acadia the Right Fit for You? 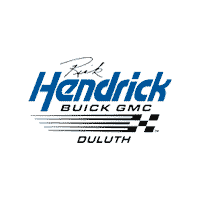 Come visit Rick Hendrick Buick GMC Duluth, today. Take a new or used GMC Acadia out for a test-drive, and let us know what you think of the SUV that has been celebrated for offering a little something for everyone. Does it have what you’re looking for in your next SUV purchase? We want to know.